"I want to be improbable and beautiful afraid of nothing as if I had wings". This is another foray into bright colours and colouring in - in fact painting with DecoArt media acrylics. 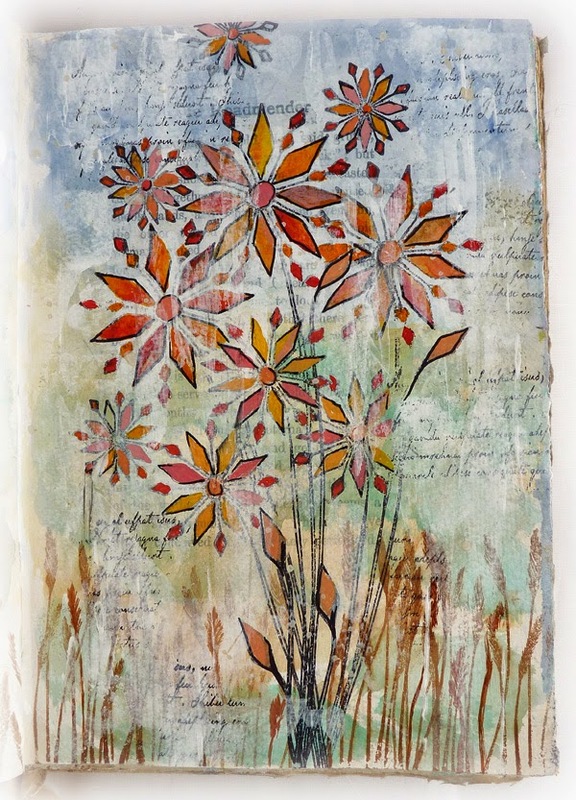 I began with the stamping using PaperArtsy Eclectica stamps by Darcy and black archival ink. To create the background I used cobalt blue hue, dairylide yellow and a touch of phthalo green-blue with lots of water and a babywipe. Using an old credit card and white gesso I dragged the white down the pages to create more interest and added some small text stamping in random places. Out came the very small brushes and a palette of cadmium red hue, titan buff, cadmium orange hue and diarylide yellow to paint in all the flower shapes. The ones on the left page were painted with quinacridone magenta. I also painted in some more grasses in different browns to make it look a little more realistic. After using a black pen to bring back some of the outline and sharpen the edges I used the credit card and white gesso again and then I splattered some watery titan buff over it. At this point I did think about using a white pen and adding highlights and maybe a border around the pages and even splashes of brown paint but I have learnt that I can go too far sometimes and overdo things so I decided to leave it right here. I'm happy. 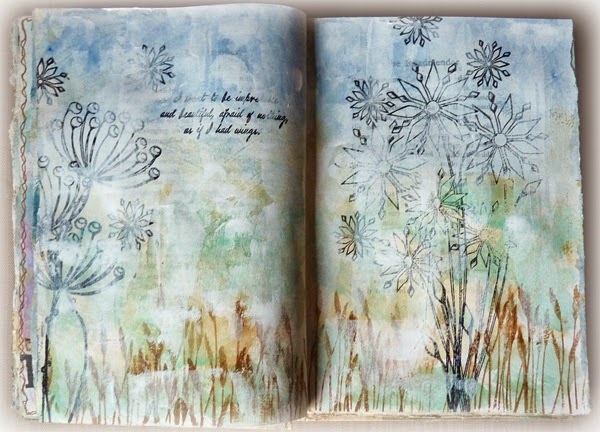 I hope you have been able to journal this week and hopefully add your creations to my Visual Journey link below. Wonderful Brenda, love the colours of those pretty flowers and what a beautiful sentiment. This is absolutely wonderful, Brenda, I love it and really fancy giving it a go. I love these stamps and the quote! These pages are so beautiful, Brenda. 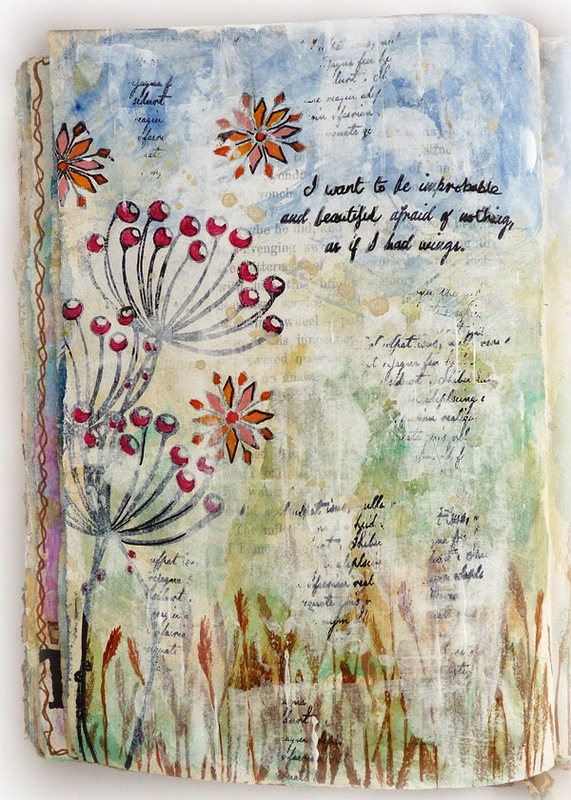 Love how you have used the paints with your stamps. Absolutely gorgeous! Your work is so inspiring! This was sooo wonderful - to see all the pictures of the stages this FABULOUS creation went thru to become truly PERFECT. The colors are amazing - so gentle but yet so alluring. Makes me want to just lie down in your grass with one of those stalks in my mouth and let the flowers flutter all around me. Your sentiment goes with it so well too. LOVE This. j. 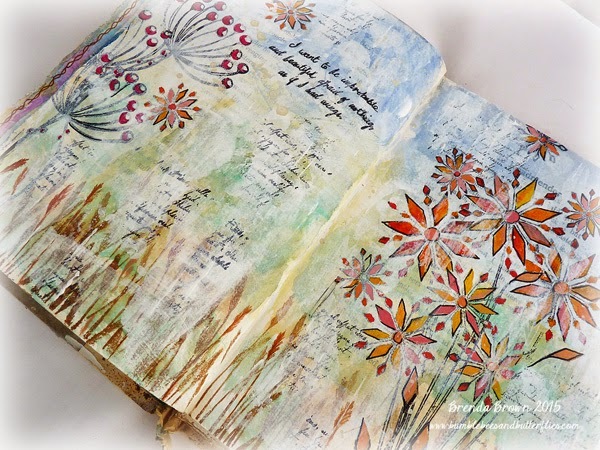 Beautiful Journalling Brenda and what a great idea to apply the Gesso with a credit card. TFS. Gorgeous scene and color in these pages! 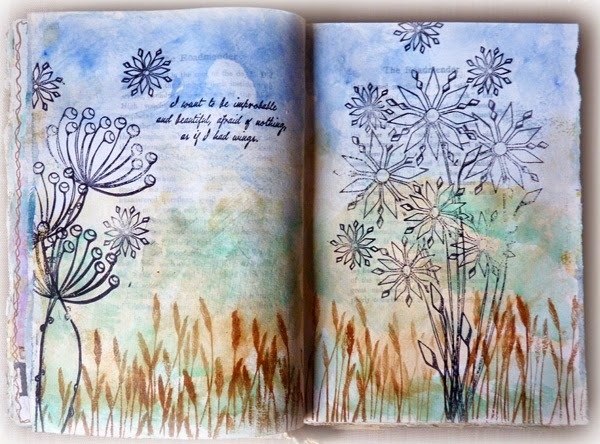 Your journal pages are fabulous as always. What a glorious spread - I love the intense fiery flowers against that wonderful muted background. Fabulous bright and happy, inspiring pages. 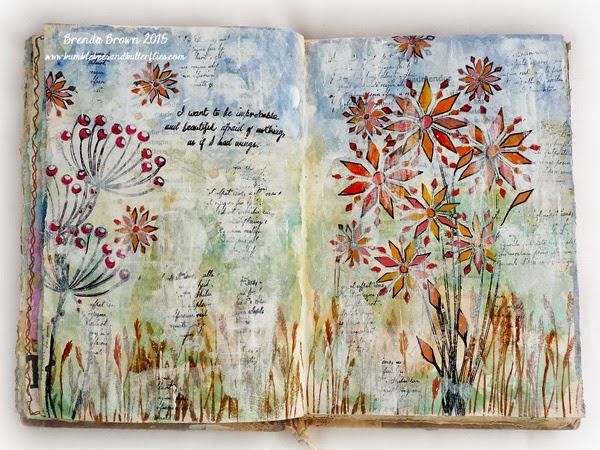 I am so impressed by all these journal pages, not because they all look wonderful but also because they keep on coming, I had full intentions of continuing and updating a page/s each month but alas the journal has been forgotten amongst much playing with other media. So Brenda please forgive me for not continuing, I am really not a person who journals, but I gave it a few months at least.